The Chef’s Hat Catering Company provides a customized, prompt and dependable service to clients who require delicious and healthy food for breakfast or lunch meetings. The company focus is on quality, variety and prompt attention. All of its products are homemade with the finest of ingredients. It is the only London catering company that specializes in last minute catering services and that has a complete on-line ordering system. The Chef’s Hat is also pleased to offer a full vegetarian and vegan menu. With a chef’s hat firmly resting on her head while working at a catering company in London, Meghan Anderson decided to throw it into the entrepreneurial ring and open her own business. 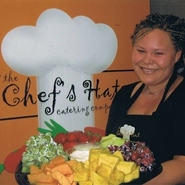 Now she juggles many hats as the owner of The Chef’s Hat Catering Company. Meghan had the fortune of experiencing the entrepreneurial lifestyle while growing up as her mother was self-employed. This laid a foundation that Meghan built upon as she made her entrance into the business world. Her first foray was the completion of a Business Administration Marketing Diploma which focused on small business management and marketing. From there, Meghan worked at and helped to successfully grow a catering company in London thereby providing her with the hands-on education she would use to start and build her own business. It was after working with the London Small Business Centre to prepare her business plan that Meghan was introduced to Futurpreneur Canada's funding assistance and mentoring program. The Futurpreneur Canada's funding was a catalyst to launching her business and the mentoring relationship she established with her Futurpreneur Canada's mentor Martin Withenshaw, has proved invaluable over the past two years. Now with the assistance of three part-time staff and a shiny new delivery vehicle, Meghan is able to live the professional and personal life she has always desired. She draws on her strengths as an independent and business-oriented person and combines that with her ability to create winning menus for her clients. With that combination, The Chef’s Hat Catering Company is a recipe for success.